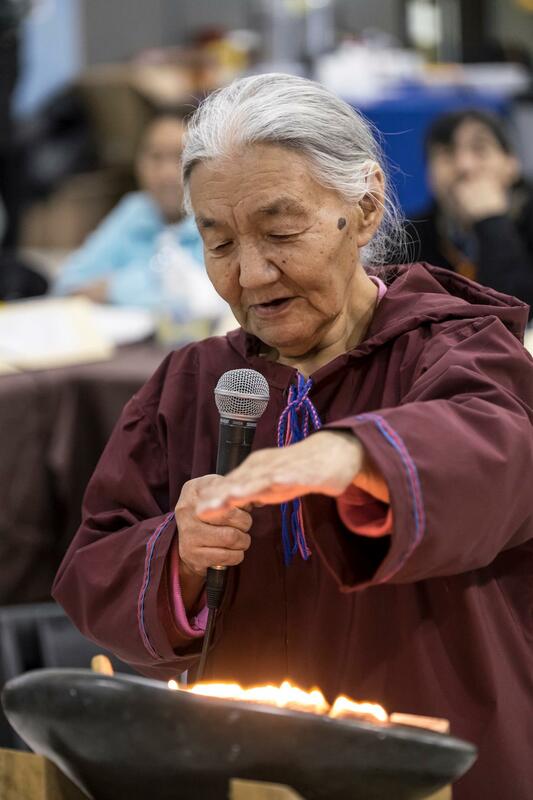 The 21st Nunavik Elders conference was held in Tasiujaq, from November 17 to 19. 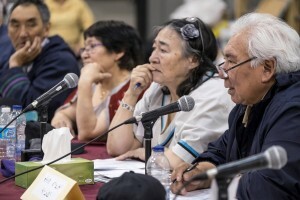 Thirty delegates from the fifteen Nunavik communities, including Chisasibi attended the event. 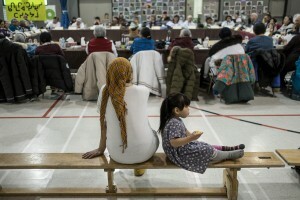 The conference is an important gathering for elders. Held every two years, the conference also acts as the Institute’s general meeting. Accordingly, a presentation of the Institute’s recent activities, a discussion on the future of the IS project on Inuktitut language, and a follow up on the Local cultural Committees activities were on the agenda. Representatives the Kativik Regional Government, the Nunavik Heath Board and Social Services, the Nunavik Cultural Tourism Development and the Nunavik Youth Forum also spoke to the delegates. Finally, the delegates had the opportunity to vote for the new members of the Board of Directors (see results below). This edition’s theme was “Family Leadership”, an element of the social fabric strongly affected by colonization and centralization. The discussion, led by Tommy Cain Sr., led to intense and emotional testimonies. A feast gathering the community and the delegates as well as the screening of the movie “So That You Can Stand” ended the event. The next conference will be held in Kuujjuaraapik in November 2017. 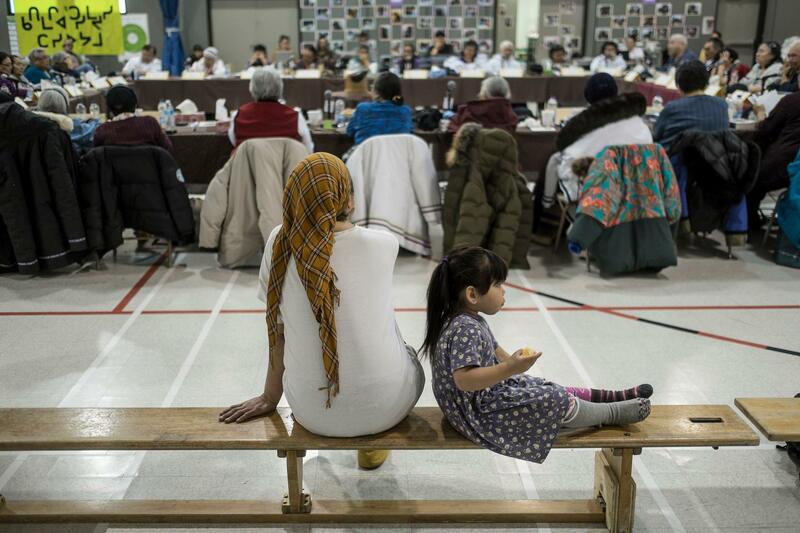 21-ᖑᒍᑎᖓ ᓄᓇᕕᒻᒥᐅᑦ ᐃᓄᒻᒪᕇᑦ ᑲᑎᒪᓂᒻᒪᕆᖓ ᑕᓯᐅᔭᒦᓚᐅᕐᖁᖅ ᓇᑦᔪᐃᔭᕐᕕᒃ 17-ᒥᑦ 19-ᒧᑦ. 30 ᐃᓄᒻᒪᕇᑦ 15-ᓂᑦ ᓄᓇᓕᓐᓂᑦ ᓄᓇᕕᒻᒥ ᐱᓯᒪᔪᑦ, ᐃᓚᐅᑎᓪᓗᒍ ᓯᓵᓯᐱ, ᑲᑎᒪᒋᐊᕐᓯᒪᓚᐅᕐᑐᑦ. ᑲᑎᒪᓂᒻᒪᕆᐅᓲᖅ ᐃᓄᒻᒪᕇᑦ ᑲᑎᕕᓪᓚᕆᐊᓗᒋᓲᕆᕙᐅᒃ. ᒪᕐᕉᒃ ᐊᕐᕌᒍᑕᒫᑦ ᐊᑑᑎᓲᒍᑦᓱᓂ, ᑲᑎᒪᓂᒻᒪᕆᒃ ᐊᕙᑕᐅᑉ ᑲᑎᒪᔨᖏᑦᑕ ᑲᑎᒪᓂᒻᒪᕆᒋᓲᕆᒻᒥᔭᖓ. 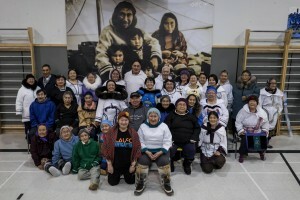 ᑌᒣᓲᖑᒐᒥᒃ, ᐊᕙᑕᐅᑉ ᐱᓇᓱᐊᕐᑕᕕᓂᖏᑦ, ᐃᓄᒃᑎᑑᕐᓂᐅᑉ ᓴᑐᕐᑕᐅᒐᓱᐊᕐᓂᖓᑕ ᓯᕗᓂᑦᓴᖓ ᐊᒻᒪᓗ ᓄᓇᓕᓐᓂ ᐱᐅᓯᑐᖃᓕᕆᔩᑦ ᐱᓇᓱᐊᕐᑕᕕᓂᖏᑦ ᑐᑭᒧᐊᒍᑎᓃᓚᐅᔪᑦ. ᙯᕐᖁᔭᕕᓂᐅᑦᓱᑎᒃ ᐅᖄᒋᐊᕐᑐᓯᒪᓚᐅᔪᒻᒥᔪᑦ ᑲᑎᕕᒃ ᓄᓇᓕᓕᒫᑦ ᑲᕙᒪᖓᑕ ᑭᒡᒐᑐᕐᑎᖏᑦ, ᓄᓇᕕᒻᒥ ᐃᓗᓯᓕᕆᔩᑦ ᐃᓅᓯᕆᔩᑦ ᑭᒡᒐᑐᕐᑎᖏᑦ, ᓄᓇᕕᒻᒥ ᐳᓚᕋᕐᑐᓕᕆᓂᕐᒧᑦ ᐱᕙᓪᓕᐊᕕᒃ ᐊᒻᒪᓗ ᓄᓇᕕᒻᒥ ᐅᕕᒐᕐᑐᐃᑦ ᑲᑎᒪᔨᖏᑦ. 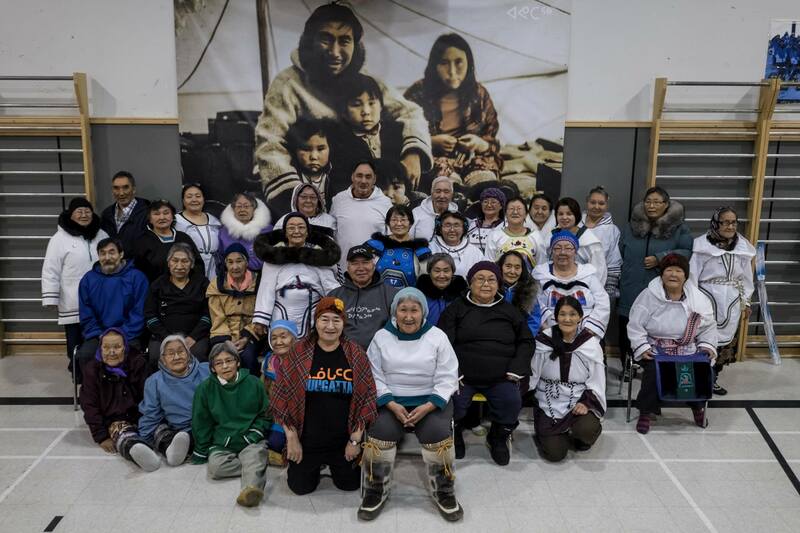 ᑭᖑᓪᓕᐹᒥ, ᑲᑎᒪᒋᐊᕐᓯᒪᔪᑦ ᓂᕈᐊᓕᓚᐅᔪᑦ ᓄᑖᓂᒃ ᐊᕙᑕᐅᑉ ᑲᑎᒪᔨᑦᓴᖏᓐᓂᒃ (ᑕᑯᓗᑎᑦ ᐊᑖᓃᑦᑐᓂᒃ). ᑲᑎᒪᓂᒻᒪᕆᒃ ᑐᓐᖓᕕᖃᕐᑎᑕᐅᓐᖑᐊᓚᐅᔪᖅ ᐃᒣᓕᔪᒥᒃ : “ᐃᓚᒌᓐᓂᒥᒃ ᐊᖓᔪᕐᖃᐅᕕᖃᕐᓂᖅ“, ᑖᓐᓇᓗ ᐃᓚᒋᔭᐅᓪᓚᕆᑦᓱᓂ ᐃᓅᖃᑎᒌᑦᑐᓂ ᐃᓂᓪᓚᖓᐅᓯᕐᒧᑦ ᓱᕐᕋᑕᐅᒻᒪᕆᓯᒪᓕᕐᓱᓂ ᑲᕙᒪᐅᑏᑦ ᐊᓯᖏᓪᓗ ᐃᓄᐃᑦ ᓄᓇᖓᓐᓅᖃᑐᐊᕐᒪᑕ ᐊᒻᒪᓗ ᐃᓄᐃᑦ ᓄᓇᓕᒻᒥᐅᒍᓯᓚᐅᕐᓯᒪᑎᓗᒋᑦ ᓅᔪᐃᑦᑑᓯᑦᓱᑎᒃ. ᐅᖃᖃᑎᒌᑦᓱᑎᒃ, ᑖᒥ ᑮᓐ ᓯᕗᓕᕐᑎᓗᒍ, ᐱᒐᓱᐊᒻᒪᕆᑦᑐᐊᓘᓕᓚᐅᔪᑦ ᑐᑦᓯᒪᖃᑦᑕᓱᑎᒃ ᐅᖄᓕᕋᒥᒃ. ᑕᓯᐅᔭᕐᒥᐅᑦ ᑲᑎᒪᒋᐊᕐᓯᒪᔪᐃᓪᓗ ᓂᕆᒻᒫᑎᑕᓂᖏᑦ ᐊᒻᒪᓗ ᑕᕐᕋᓕᔮᕐᑎᑕᐅᓂᖏᑦ `ᓇᐸᒍᓐᓇᓯᖁᓪᓗᓯ`-ᓚᔪᒥᒃ ᑭᖑᓪᓕᐹᕐᓯᐅᑎᐅᓚᐅᔫᒃ.